Around 50,000 Padaung people live in the thick forests west of the Salween River and around the Pekon Hills, in Kayah State and southern Shan State of eastern Myanmar. Their traditional homeland is north-west of Loikaw town. Today they are concentrated in seven villages centred around their biggest village, Bangpe. Five hundred Padaung also live in Thailand, inhabiting three villages within Muang District of Mae Hong Son Province, very near the border with Myanmar. The Padaung first arrived in Thailand in 1988 when they fled fighting between Burmese troops and ethnic minorities in Kayah State. In their own language the Padaung call themselves Kakaung, which means 'people who live on the hilltops'. 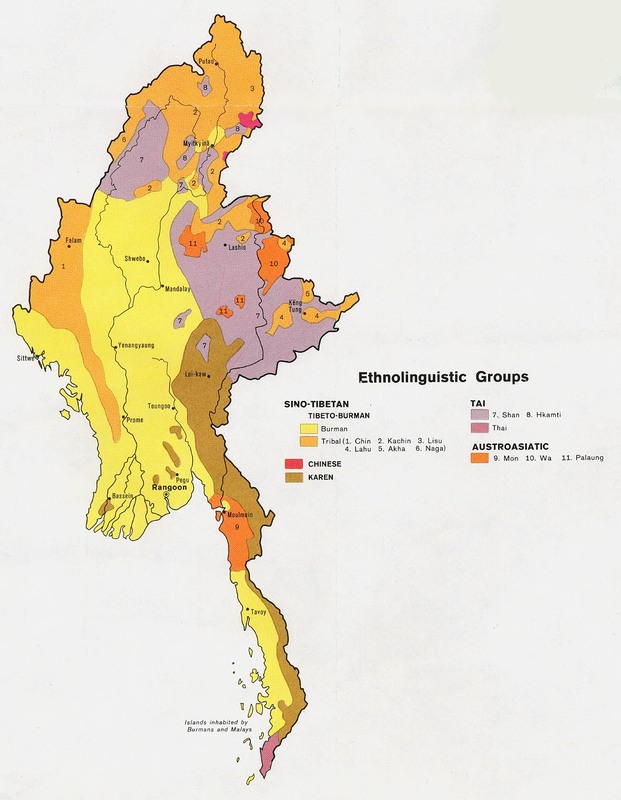 The Padaung language is closely related to that of the Lahta tribe in Myanmar. It is part of the Karen branch of the Tibeto-Burman family. For centuries the Padaung women have been a source of curiosity because of their custom of wearing up to 32 gold-coloured brass neck coils. Once they were even brought to the court in Mandalay for official inspection. In the past girls adopted their neck rings on their fifth birthday and added one more coil each year until they were married. These days the custom is fading in Myanmar. Women in only three villages reportedly still practise it. In Thailand, however, many Padaung women have continued the practice out of economic necessity. After their tribe moved into the country from Myanmar they settled along the border, but they were prohibited from cultivating the land because they were not Thai citizens. Tourist agencies saw an opportunity to make money from the strange-looking Padaung women. Hordes of camera-clicking tourists have flocked on pre-arranged visits to photograph the 'long neck' women, as they have come to be known. The Padaung's religious beliefs are a curious mix. One source says, 'The majority of the Padaung are Buddhists, but their religion is tempered with animist beliefs and practices. Scripture Prayers for the Kayan, Padaung in Myanmar (Burma).